When you mention the Carters of Lancaster County, or Virginia in general, the typical Virginia history buff thinks of the remarkably wealthy and powerful Robert “King” Carter, wealthiest man in Virginia at the beginning of the 18th century. Unbeknownst to most, though, is an unrelated but important family of Carters who also settled in Lancaster, not far up the Corrotoman River. Thomas Carter and his descendants were friends and business colleagues of their similarly named neighbors. So if you can trace your lineage to either of these important families, you’re in good company. 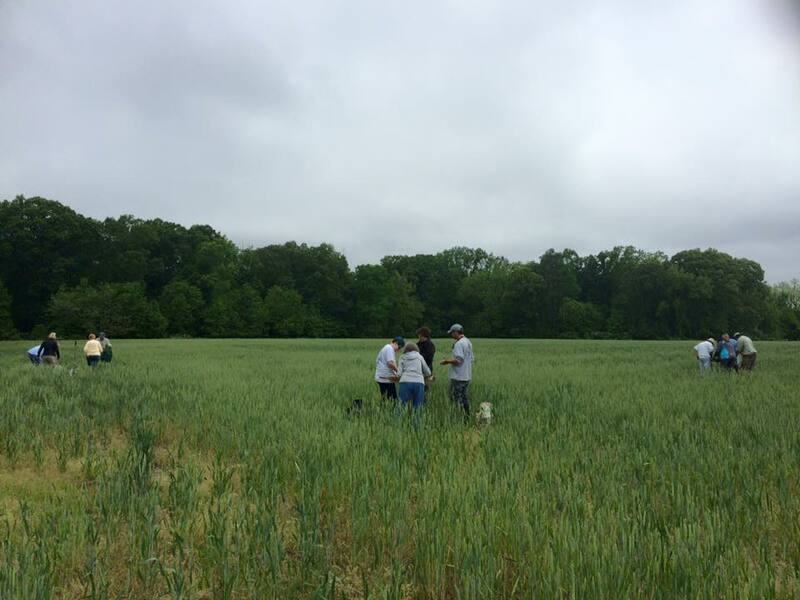 We began our own adventure with The Carter Society of Colonial Virginia Carters in 2015 when descendant Bob Lumsden approached us with the idea of finding the Thomas Carter cemetery and the family’s ancestral home. Limited surface collection and testing in the 1980s located several archaeological sites in the vicinity of “West Point”, including one that dated to the period of Thomas Carter’s life. The in-depth research conducted by the Society, comparing maps, plats, landscape features and other information, confirmed this peninsula as the early landholding of the Carter family. The land was given to Carter and his wife, Katharine Dale, around the time of their marriage, by his father-in-law Edward Dale, who served for many years as the Lancaster County clerk of the court. Thomas, who died in 1733, willed the property to his son, Thomas, Jr., who was an associate and friend of Robert “King” Carter. They were not related, but both served as wardens of Christ Church together. It is not clear what happened to the original house, but Thomas, Jr. likely constructed a new house on a more elevated position overlooking the river. Our role was to work with the Society, and the other local collaborating organizations, to conduct an archaeological survey of the site area, define the site’s boundaries and chronology, and complete an analysis of the artifacts we recovered alongside those found in the early 1980s by the Mary Ball Archaeology Committee. Teams spread out across the field digging a grid of shovel test pits to search for the core of the site. After initially identifying a 19th-century site just north of the standing house on the property, and then a stretch of field with very few artifacts (although, interestingly, a handful of prehistoric stone tool flakes, perhaps suggesting the presence of a much older site), we eventually found a significant concentration of late 17th-/early 18th-century artifacts in the northwest corner of the field, along the tree line. This was precisely where the prior surface collection and test unit had identified the site, so the survey both corroborated and augmented the earlier findings, providing a broader level of information about the size and potential integrity of the site. The initial shovel tests were dug at fifty-foot intervals, but we collapsed the distance to twenty-five feet within the core of the site to retrieve a better sample of the material culture. Most of the shovel tests yielded artifacts such as handmade brick, oyster shell, and tobacco pipe fragments, along with hand wrought nails, and the occasional fragment of animal bone and delftware. Perhaps the most intriguing discoveries were ceramics that helped date the site, specifically North Midlands slipware. This ceramic was popular during Thomas Carter’s time in Lancaster County, from the 1670s to 1730s. 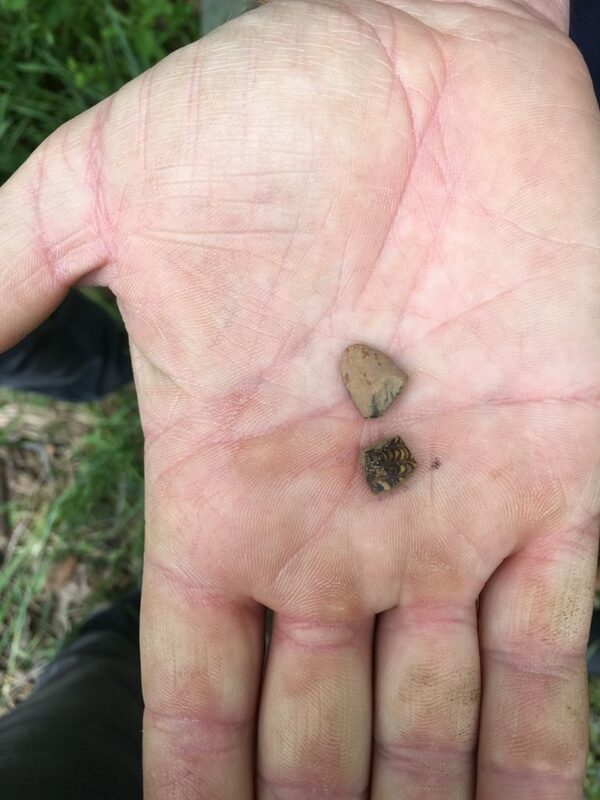 Small fragments of imported tobacco pipe and North Midlands slipware recovered during the survey. And while its popularity continued through the Revolutionary War, the absence of several other popular and fashionable ceramic types (namely white salt-glazed stoneware and creamware) suggests this site was abandoned before those wares became commonplace. Analyzing the artifacts in the coming months will help us build on this hypothesis, including reviewing the earlier recovered materials, which are being cataloged by Melanie Healy-Marquis of George Washington’s Ferry Farm (and also a Thomas Carter descendant). The tobacco pipe fragments in particular may help us establish a more firm chronology for the site. These ubiquitous colonial artifacts are particularly good for establishing occupation ranges, as their bore diameters decrease over time at a consistent rate, helping archaeologists pinpoint periods of intense activity. Dr. David Brown engages a group of volunteers as he explains the significance of certain artifacts found during the survey. 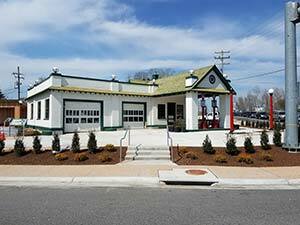 “The dig was sponsored by The Carter Society of Colonial Virginians, Mary Ball Washington Museum & Library and Historic Christ Church & Museum. The professionalism and organization of the 3 day event was excellent and the co-sponsoring organizations look forward to further exploration of the site for evidence of the home dwelling, outbuildings and a family burial site. It was a pleasure and privilege to be able to work with Fairfield Foundation to explore this historically significant part of Christ Church Parish in Lancaster County,” adds Robert Lumsden, organizer and volunteer. We are proud of the great work accomplished by the dedicated volunteers and all of the support given by the project collaborators. 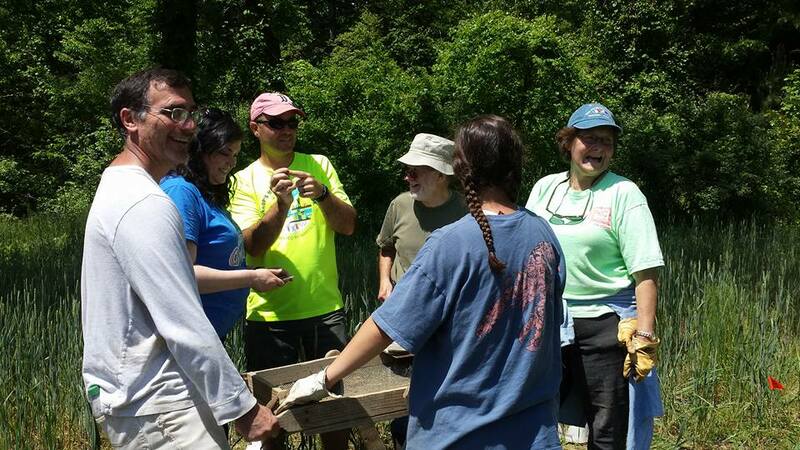 It was truly an honor for us to be able to work alongside this welcoming, engaged group of people, and contribute to their efforts to find their ancestors’ home, understand life during this early period of Virginia history, and preserve the memory of all of the people who once lived at this site. Based on the recent findings and participant enthusiasm, we are optimistic that we can return to the site in the future to evaluate its integrity by excavating several larger test units, and perhaps employing non-invasive techniques at the nearby location of a potential Carter cemetery. Could this work uncover part of the footprint of Thomas Carter’s original dwelling? You will have to stay tuned to find out! Great format for increasing public interest in archaeology and history.